Cathy Adelman, Edward Lear, Another Nonsense Story, The Old Stile Press, GB, 1990; Dos-a-Dos structure, marbled paper binding with leather endbands. Cathy Adelman, Voltaire, Le Monde Comme Il Va Press Intermezzo, Austin, 2000; Full leather binding in the French style; leather doublures and fly leaf, graphite edge with silk endbands, paladium title and tooling, with leather onlays. Pamela Clare Barrios, Jumping Fish; Laser-printed accordion flag-style book explores shadows and movement. Designer/Printer/Binder: Carolee Campbell,Michael Hannon, Burn Down the Zendo Ninja Press, Sherman Oaks, CA, 2004. Book structure is modeled after ledger books used in Japan during the Edo Period. The sumi ink Kanji on each cover by David Brock. The hand-made paper covers are of Egyptian tow flax by Bridget O'Malley at Cave Paper. Edition 110 copies. Binder: Coleen Curry, Alice Van Schaack, A Familiar Letter from a Daughter to her Mother. Havilah Press, Emeryville, CA, 2002. Full leather binding, laced in boards in the French style; sunken suede doublures and paper fly leaves, silk endbands. Leather panel on the cover is executed in "Lacunose" style with blind tooling. Binder: Coleen Curry, Enid Marx, Some Birds and Beasts and Their Feasts, Incline Press, Oldham, GB, 1997. Full leather goatskin binding in the French style; leather doublures and suede fly leaves, silk endbands, titled in soot. Binder: Heidi Ferrini, Model of 18th Century Full Leather Trade Binding. Full leather binding with gold and blind tooled decoration on front cover. Single flexible sewing around six- ply hemp cords is splayed out on laminated boards, with plain-leaved end papers, and double-core silk endbands. Binder: Heidi Ferrini. Model of 16th Century German Wooden Board Binding with Clasps. Packed sewing over split alum-tawed thongs, channeled and pegged wooden boards shaped with inside bevels for shoulder support, forming the text-block round. Endpapers are double folios with sewn-in linen hinges; silver clasps with catchplate on lower board. Binder/Artist: Georgette Freeman. Ghost Ranch Getaway, Vol.II. Carrousel structure with box; materials include color xerox, watercolor paper, chip board, and ribbon. Binder: Patricia Galante. 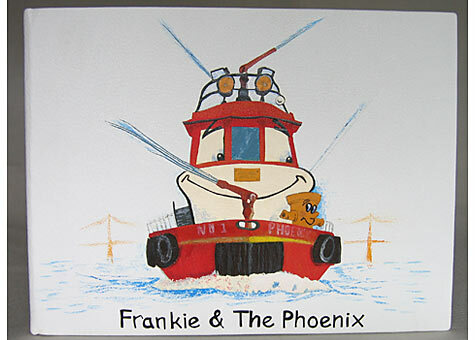 Nancy Coopersmith, Frankie and the Phoenix. Illus: M. Goldyne, and D. Farnsworth. 4G Publication, San Francisco, 2004. Fine binding in full white buffalo skin. Colored calf onlays are highlighted with acrylic paint, doublures and fly leaves are of light blue ultrasuede. Binder: Diana Goldstein. Gary Snyder, Fragments of a Poem. Concertina codex structure allows the book to be opened flat for display. Based on a poem by Gary Snyder, the "rhythmic writings" in the text are similar to drawing, in that the meaning of a phrase gives shape to the design of the script. Binder: Lindsay Hague. Dorothy and Lewis M. Allen, The Allen Press. Bibliography - A Facsimile of the 1981 Publication With Leaves of Original Publications. The Book Club of California, San Francisco, 1985. Traditional laced-in full leather binding of black Chieftan with onlays of red calf and embossed covers. Paste paper fly leaves, with gold fore edge decoration. Binder: Karen Hanmer: Collection of Short Stories by various authors, The Bedroom Companion Farrar and Rinehart, New York, NY, 1935. Millimeter binding. A compilation of naughty stories for men, bookcloth made by binder from fabric reminiscent of a hipster's dressing gown. Goatskin trim at foredges, head and tail. The edges are colored with acrylic to match the paper label. Binder/Artist: Lyall F. Harris: My Father. Carousel structure, hand sewn, one-of-a-kind mixed media artist's book. Designer/Publisher: Havilah Press: A Guide to the Grand and Sublime Scenery of the Sierra Nevada. Joint publication with The Bancroft Library, University of California, Berkeley, 2006. The book includes a digitized facsimile of this extremely rare pamphlet which was the first published guidebook to the southern Sierra Nevada. The facsimile was printed offset and the introduction and appendix are letterpress. The book is bound in quarter cloth with pictorial covered boards in an edition of 250 copies. Binder/Artist: Yoshiko Catherine Hedges: Think.Speak. 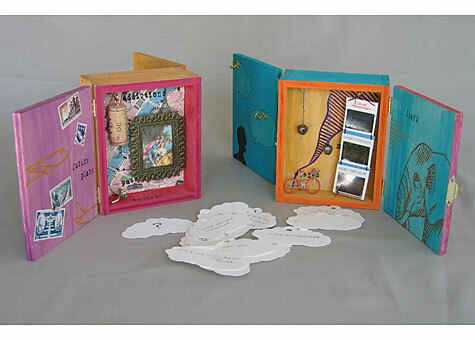 A pair of mixed media interactive books in which the reader is involved in creating/choosing the text. Each person chooses what their book will say, using the text that they write themselves, along with what past readers have written. The conversation changes every time the books are read. Printer/Binder: Terry Horrigan: T. Horrigan, J. Shipman, S. & N. Loux, D. Polasky Dorothy:Images Protean Press San Francisco, 2001. Accordian structure, printed letterpress on both sides in Romulus Roman and Oblique Roman types on BFK Rives with etchings by Terry Horrigan. The poems were written by Dorothy's daughter, granddaughter, and grandson. The text tells of her life from 1938 to 1997. Binder: Signa Houghteling: Oral History: Joseph Houghteling. Joseph Houghteling: Print, Politics and Public Affairs. Regional Oral History Office, The Bancroft Library, UCB, 2002. Single sheets of text "perfect bound" by Klaus-Ulrich Rotscher. Split board case bound construction in full goatskin. Brown covers with contrasting spine in black, title in gold. Endsheets are hand marbled, with silk endbands. 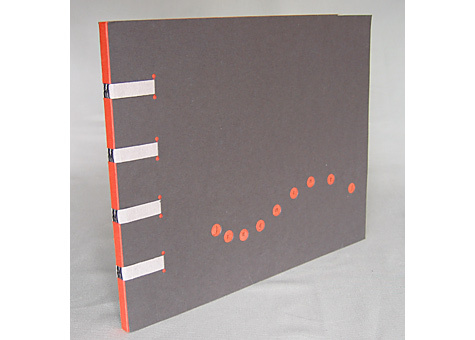 An edition of six, each a different style of binding. 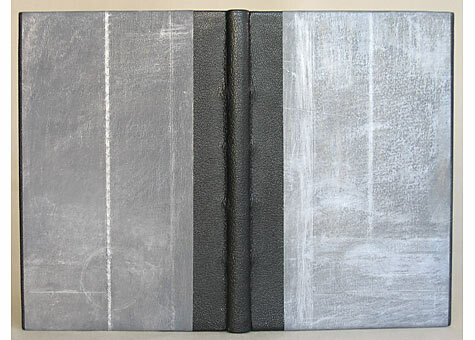 Binder/Artist: Marie Kelzer: A Blank Book-The Fading Word. Paper Arts, San Francisco, 2006. Hand bound blank book sewn on linen tapes. Half bound with faux leather spine and corners; hand painted with acrylic on canvas. The boards are covered with hand decorated paste papers by the binder, using a letter stamp. The blankness of the book symbolizes the fading use of words with shorthand, email and text messaging, the word continues to diminish. Binder: Catherine Kornel: Box #1 Box with magnetic closure. Paper designed by the binder: tie dyed with monoprint on top. Binder: Catherine Kornel: Box #2 Paper designed by the binder: monoprint with collage. Binder: Monique Lallier Maurice Gagnon, Peinture Moderne Valiquette, Montreal, 1943 Full leather binding in green goatskin, with laced-in cords. Blind tooled, inlay and onlay decoration, with crushed pewter inlay. Embroidered endbands, top edge decorated with graphite and color. Accompanied by chemise and slip case. Bound in 2004. Binder: Sharon Long; Ansel Adams, The Negative, Exposure and Development. New York Graphic Society, Boston, 1948. 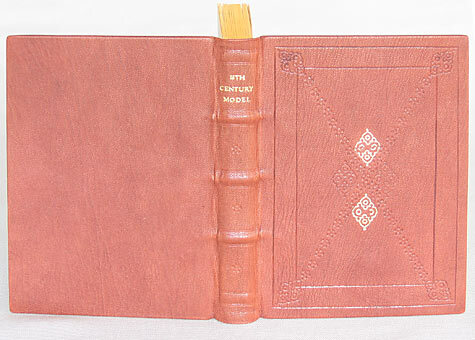 Quarter leather goatskin binding in the French style with silk endbands. The cover paper is decorated with graphite and silver thread; graphite edge decoration, and paste paper end leaves by the binder. Binder: Sharon Long: Lao Tze, Tao Te Ching. Alfred A. Knoph, Inc., New York, 1994. Full leather binding in the French style with lightly sanded blind tooling of the character "water". Silk Endbands with gold and graphite decoration on the top edge. End leaves are paste papers by the binder. Binder/Artist: Hisako Nakazawa: Series "Endless" #H and #I. "Endless" #H and #I are based on a Japanese trik book. 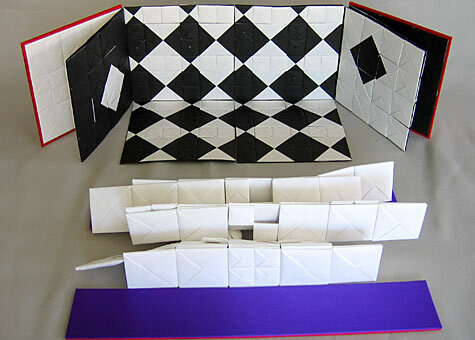 The book can be endlessly expanded by connecting folded paper of various sizes. The box is an integrated part of the books. The structure is based on Japanese ORI-HON (folding book). Materials used: black and white paper and silk cloth. Binder: Sabina Nies: John Muir, Heaven on Earth. Press Intermezzo, Austin, Texas, 1998. 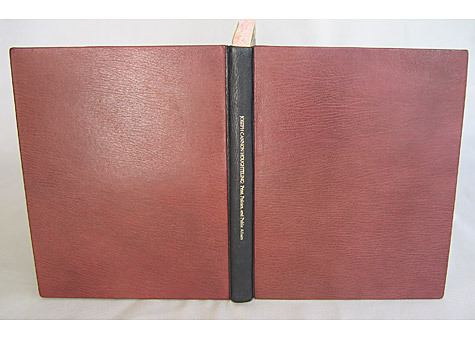 Full leather brown goatskin binding in the French style. Pyrite insert on the front cover, with red leather full doublures; hand marbeled paper by Einen Miura. The clamshell box is half leather with onlay, marbled paper by the binder, and gold tooled title. The inside is lined with suede, with a recessed area to accommodate the pyrite on the book's cover. Binder: Lauren Ottariano: Harper Lee, To Kill a Mockingbird. Harper Collins Publishers, Inc., New York, NY, 1999. Leather case bound book with window, layered board, spine stamping, and tie. The leather represents tree bark, with the objects in the window being the treasures found in the hollow of a tree. The clamshell box is constructed in a different way than a standard clamshell, with two doors in front, stamping with a twine tie and lift. The different colors of the box lining represent the two skin tones of the book's main characters. 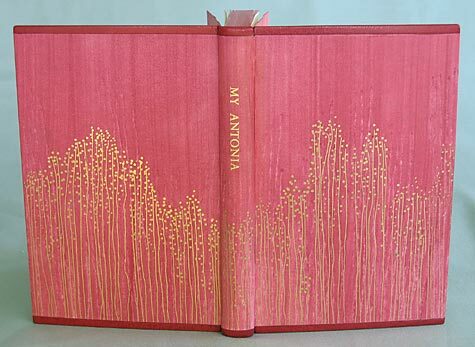 Binder: Joanne Page: Willa Cather, My Antonia, Vintage Books, Random House, Inc., NY,1994; Case binding sewn on tapes. Paste paper covers and fly leaves by the binder. Red goatskin edges on head and tail, Colored top edge with silk endbands; gold tooled cover decoration. 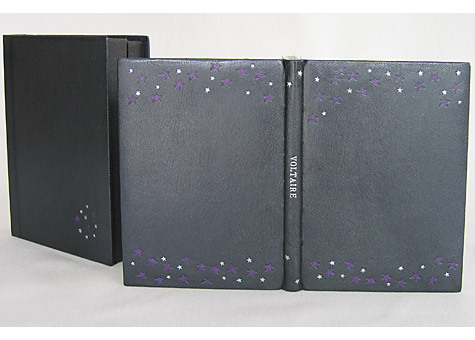 Binder: Joanne Page: Edward Powys Mathers, Coloured Stars, Versions of Fifty Asiatic Love Poems. The Riverside Press, Cambridge, n.d. Sewn on vellum bands and laced into vellum covered boards. Painted design on front and back covers by the binder. Silk endbands, decorative Italian paper flyleaves. 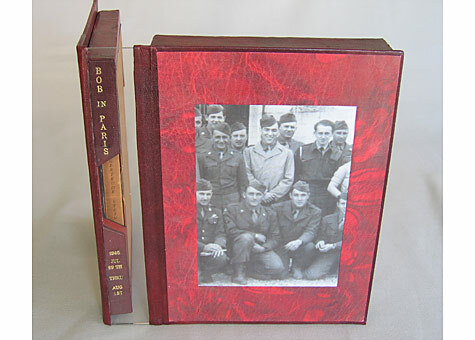 Binder: Robert Rosenzweig: Bob in Paris: 1945-July 29th thru August 1st. Robert S. Rosenzweig, San Francisco, 2005-2006. The drop-back box was constructed to hold a group of items the binder acquired on a four day pass in Paris. The box is designed to open and reveal the contents of both trays without the contents of the upper tray falling out. This was done with a hinged acrylic panel held in place with a Velcro tab. The spine of the box is acrylic, the covering leathers are Harmatan brown goat, and "Floriated" red and black leather. The image on the back is an enlarged copy of the tour photo. The frame of the image on the front of the box is a xerox copy of the "Floriated" leather. The image is a further enlargement of the tour photo. The soldier in the light jacket is a portrait of the binder as a young man. Binder: Robert S. Rosenzweig: Joyce Lancaster Wilson, The Swing. Illustrator: Joyce Lancaster Wilson. The Press in Tuscany Alley, San Francisco, 1981. Orange Harmatan leather in a French tight-back structure. Green leather doublures, ultrasuede fly leaves, and silk endbands. The artist of the velum covered illustrations on the front and back covers, is Hannah Rosenzweig, executed when she was between seven and eight years old, for her grandfather, the binder. Binder: Lily Stevenson: Four Japanese Stab-bound Books in a Box. The red cloth-covered handmade box is lined with paper from Thailand. The set of four blank books is made from Thai mulberry paper. Binder: Lily Stevenson: Journal. The soft leather-bound blank book has handmade Iowa walnut fly leaves. The book block is Rives paper sewn on tapes. It is an experimental piece to see if embossed upholstery leather could be used to make a soft cover. Binder: Carla J. Tenret: Collected Prints of Nancy Culmone. The album consists of signatures sewn to accordian pleated "cave" paper. The signatures are handmade oriental papers with floral or leaf inclusions. Binder: Carla J. Tenret: Calligraphers: Carla Tenret, Sandra Torguson,Vicky Lee, Joann Burchfill, Catherine Von Schwind, and Maryann Wight. Garden "A Round Robin" Accordian style book written on Arches Text Laid with mixed media; a calligraphic round robin by six calligraphers. The cover is executed in watercolor by the binder. Binder: Alice Vaughan: Pasadena. Archetype Press, Art Center College of Design, Pasadena. 2005. The letterpress work was done by the students of Archetype Press, Art Center College of Design under the direction of Gloria Kondrup. The binding of book and box executed by Alice Vaughan. Edition of 101. Binder: Alice Vaughan: Sinful. 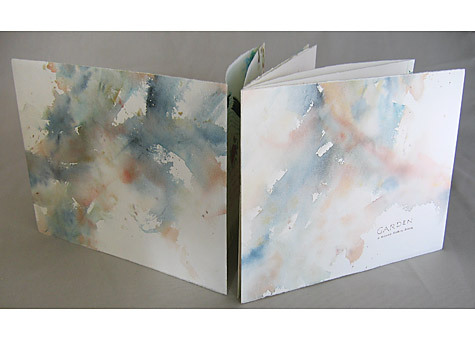 Archetype Press, Art Center College of Design, Pasadena, CA, 2005. Class letterpress project by ten students from Flintridge Preparatory School in conjunction with Archetype Press. The twelve letterpress scrolls include one colophon scroll. The boxes constructed by Alice Vaughan. Edition of 20.